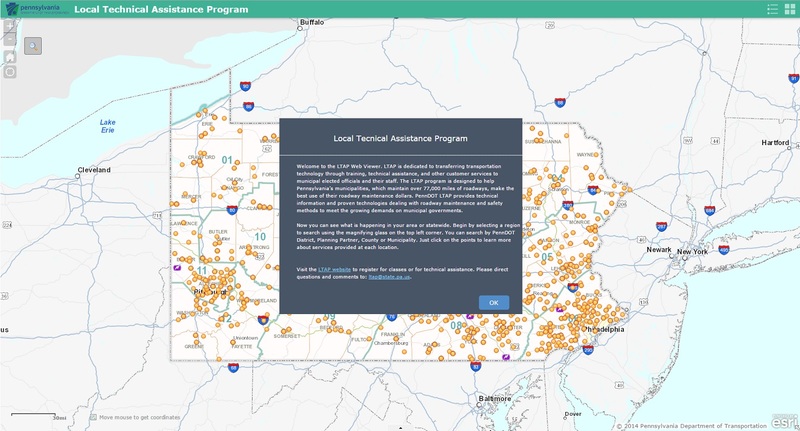 The PennDOT Local Technical Assistance Program (LTAP) is one of 58 LTAP centers across the nation (one in each state, Puerto Rico and seven regional centers serving American Indian tribal governments.) These centers are dedicated to transferring transportation technology through training, technical assistance, and other customer services to municipal elected officials and their staff. The LTAP program is designed to help Pennsylvania’s municipalities, which maintain over 77,000 miles of roadways, make the best use of their roadway maintenance dollars. PennDOT LTAP provides technical information and proven technologies dealing with roadway maintenance and safety methods to meet the growing demands on municipal governments. PennDOT LTAP has provided technology transfer services to Pennsylvania’s 2600 municipal governments since 1983. On average, the PennDOT LTAP training and technology transfer programs train and assist nearly 6,000 municipal employees per year in effective and efficient maintenance procedures, essential safety practices, and infrastructure management processes. Historically, PennDOT LTAP has augmented this training with nearly 200 one-on-one technical assistance sessions and the dissemination of approximately 50,000 pieces of information highlighting practical technological advances Read more..
What is the Roads Scholar Program? Workshops are conducted at convenient locations throughout the Commonwealth. During these workshops, participants are educated on up-to-date maintenance and safety topics taught by LTAP's technical experts. You can track your progress by logging in to your account, using the View My Schedule feature. Just clear out the start date and click on the search button. Check the current class offerings for more information. Read more.. The PennDOT LTAP Advisory Committee is comprised of a group of approximately fifteen (15) municipal government (elected and/or appointed) officials who serve a critical role as program advocates and assist PennDOT by attending training courses, reviewing course materials and content, and functioning in an advisory role on a variety of LTAP issues. Find the LTAP Advisory Committee member near you. Take advantage of LTAP's Roads Scholar Programs and/or "Road Shows"
COSTARS is a new approach to the Cooperative Purchasing Program.